Welcome to the next Chocolate Monday! During these scorching hot days of summer, I am always looking for something to help me cool off. These Brownies with Cheesecake Frosting are the perfect chilled treat, rich and satisfying and very easy to make! I love the intense chocolate of the cocoa brownies combined with the creamy cheesecake frosting. It is pretty much the perfect dessert anytime of the year but especially during the summer. Just imagine how well these would be received at your next BBQ!! I really appreciate how easy this is to make and how well it converted to gluten-free. The brownies have enough moisture in them that I didn’t have to add any gums. They are rich and indulgent! Both layers come together easily, but you need to wait for the brownies to cool thoroughly before frosting. If you want, make the brownies a day ahead and finish on the second day. The cheesecake frosting will take about 8 hours or overnight to firm up enough to slice through cleanly. One of the tools you need is a knife that is long enough to bridge the whole bar. With a 9-inch pan, a 10-inch knife is perfect. I love this granton edge carving knife. It has a thin blade that is razor sharp and is long enough to gently press on both ends to make sure it cuts all the way through the first time. If you don’t already have one, a honing steel should definitely be part of your knife set. It helps keep the edge of your knives sharp by straightening it again, getting rid of any little burrs that might be present – a common occurrence. If you want to learn more about steels, take a look at this article from Serious Eats. If you want perfect slices, follow the directions in the recipe. A clean, hot knife literally will go through the cheesecake frosting and brownies smoothly. Just pull the knife straight out toward you and not back up through the frosting. Then clean and rinse the knife again before making the next cut. 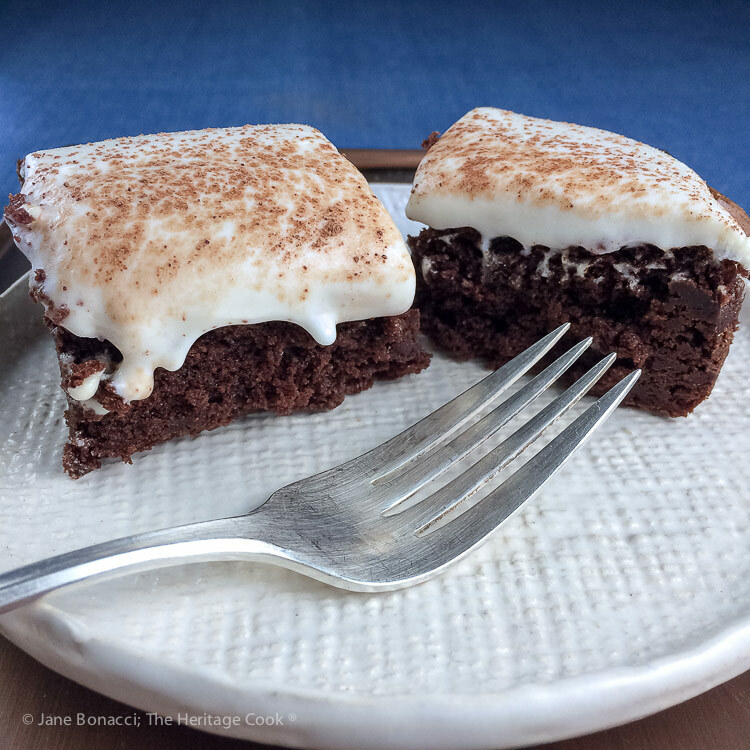 I hope you make and enjoy these Brownies with Cheesecake Frosting ~ they are so good! Yep, I just finished the ones I used in the photos and loved every bite!! 🙂 Happy Chocolate Monday! Use your favorite gluten-free flour blend (like King Arthur, Bob’s Red Mill, or Pamela’s) or make your own blend from scratch and save some money! Chocolate shavings, sifted cocoa powder, mini chocolate chips, drizzled ganache or caramel sauce, etc. Preheat oven to 350°F. Butter a 9-inch square baking pan and line with parchment. Leave the ends hanging over two edges to create a sling to help lift the brownies out of the pan. Make the Brownie Layer: In a saucepan, combine the sugar and butter, heating over medium heat until butter is melted, stirring often. Cook about 3 more minutes, stirring often, to partially melt the sugar. Pour into the bowl of your stand mixer and add the salt, vanilla, and cocoa. Mix on low with the paddle attachment until blended and cooled slightly, then add the eggs and beat until shiny. Scrape the bowl and beater(s). Whisk together the flour and baking powder, then mix into the batter until fully incorporated. Scrape the bowl and beater(s) and mix again. Pour the batter into the prepared pan, spreading it with a spatula into the corners. Bake about 35 to 40 minutes or until the top is set and a toothpick inserted in the center comes out with a few moist crumbs. Transfer to a wire rack and cool to room temperature. Note: If you are using gluten-free flour, this cooling will help the brownie layer not collapse under the weight of the cheesecake layer. Can be baked a day ahead and finished the following day. When cooled, cover and set aside. Prepare the No-Bake Cheesecake Layer: In the bowl of your stand mixer, using the paddle attachment, combine the cream cheese, sugar, lemon juice, vanilla and salt. Mix on low until blended, then increase speed to medium and beat until smooth. Scrape the bowl and beater. Spoon the mixture on top of cooled brownie layer, smoothing to the edges with an offset spatula. Cover with plastic and refrigerate at least 6 hours or overnight to fully firm the cheesecake layer. To Serve: Remove plastic and garnish if desired. Run a knife around the edges to release the brownies from the pan. Use the parchment to carefully lift the bars out of the pan and set on a cutting board. Use a very sharp, long bladed knife. Run under hot water, wipe dry and make the first cut. Repeat between each cut for the cleanest slices. Serve cool or cold. Store, covered, in the refrigerator. * If you don't have a high power mixer or if the cheesecake mixture is really runny, you can serve this as a cheesecake dip instead. Whip as well as you can, chill to thicken, then serve alongside the brownies in small bowls. Just as delicious and maybe even more fun because kids get to dip them! !